Flour sacks are not really sacks at all, but sheets of fabric made of very thin cotton threads. The cotton was quite fine and had a special weave, which increase the surface area that gives this fabric a drying superpower. Flour Sacks have many uses in the kitchen because they are lint-free and safe to use around food. Since Flour Sack Towels are super soft, completely lint-free, absorb like paper towels, and dry faster than normal kitchen towels, they add unsurpassed sparkle to dishes, glassware, and windows. Even better, they make superb dusting cloths because they leave no lint behind! You can use them as alternative cheesecloth or for when you need a cloth strainer for recipes. You can also wrap warm rolls in them to keep them warm. After utilizing the cooking supplies, these flour sacks were washed and again ready for next projects which one need (can be used again and again). VALUE PACK: Set of 12 premium white 100% cotton flour sack towels measuring 28 x 28 inches are specially designed for home & commercial use. 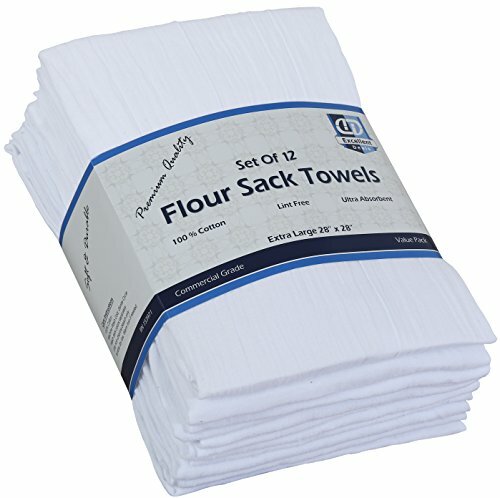 HIGH QUALITY: Made from 100% Cotton ring spun, each set weight 28.5 Oz / 12 Pieces ; Tight consistent weave and smooth texture with minimal pilling and no lint ; These flour sack towels are quick-drying and durable; They get softener and better with every wash; the flour sack are highly absorbent, long-lasting. VERSATILE / VERSATILITY: Multipurpose towels can be used just about anywhere in the home, restaurant, bakery & Commercial kitchen; Can also use for Embroidery (hand), applique, painting, screen printing. EASY CARE : Just machine wash and dry, Cotton Flour Sack Towels are carefully designed to resist shrinking, maximize absorption and reduce lint. EXPERTLY TAILORED : Hemmed edges are carefully crafted; Lint free and natural, makes for the best choice of material. If you have any questions about this product by Excellent Deals, contact us by completing and submitting the form below. If you are looking for a specif part number, please include it with your message.